This art piece is a part of “Party in the 21st Century” collection. Please take a minute to read about, so that you can better enjoy it. Thank you. 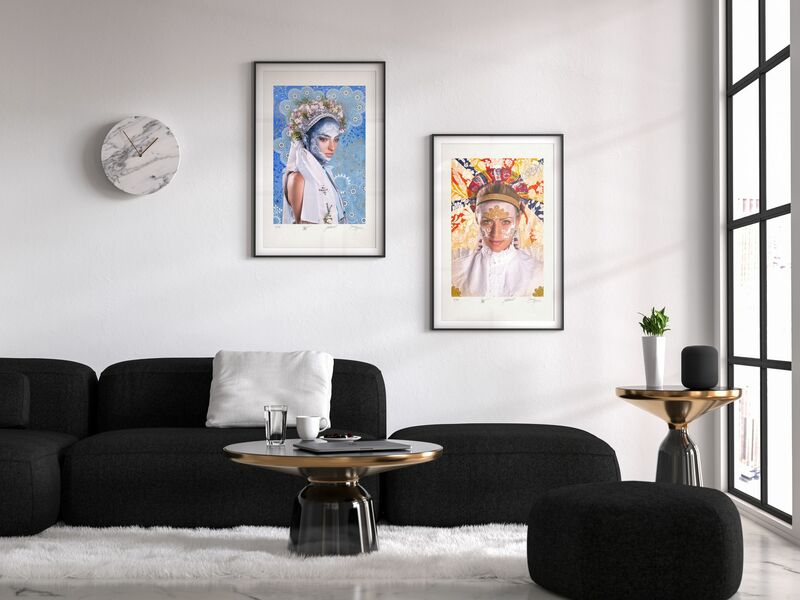 The collection of unique paintings from “Party in the 21st Century” shows with new and modern optic the beauty of the Slovak culture. This little country in the heart of Europe is a real hidden treasure of what is left after the old craft masters. Thanks to the beauty and really rich diversity in this country, I fell in love with its ornaments, symbols and colors. The collection documents a certain part of this, something what is almost extinct - traditional bridal headbands, in Slovak called “Party”. On every art piece, there is a portrait of a young lady with such “party” on the head, traditionally dressed, being in deep thoughts - just like the girls in the past were before their marriage. This part is photography on the canvas. Everything surrounding it is hand painted. Here I played with the ornaments and its meaning and color combinations that are not in accordance with the color rules, but are somehow very honest and follow the spirit of things. To me as an artist it is a very special experience, to on one side follow the rules and on the other to flow free, getting inspired by the personality of the portrayed bride and her deep thoughts and dreams. I developed a special way of painting style for this collection which is a combination of more aspects. The most important to me was timelessness of the symbols and their geographical independence. We can find similar ways of how the craftsmen from whole Eurasia (or even the whole world) depict this spirit, even in the meaning of symbols, their combinations and color. Most of all I found the inspiration for this technique in Japan in the postmodern “superflat” art movement and in England in the work of the 19th century textile designer William Morris (British Arts and Crafts Movement). 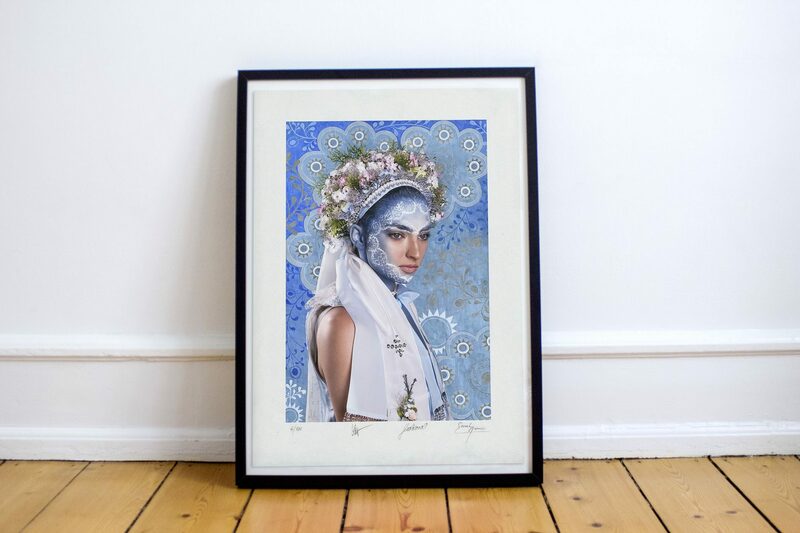 To that I added my sense for the energy and spirit of symbols (the most significant ones being fertility, protection and longevity) and combined them with the aim to create the atmosphere around the portrait that is a pure extract of deep human wishes. To put it on canvas means for me making the desired story happen. I am very proud to be a part of the team of this collection. My co-authors are awarded photographers Lubo Sabo and Zuzana Senasiova (d.b.a. LSZ photography) and Katarina Chabrecekova is responsible for the ethnological part. It was her idea to secure these treasures. The historical “party” has never been documented before so this collection has also an educative character. Special thanks belongs also to our make-up artist Andrea Lubocka and Patrik Rago, lovely portrayed ladies and to the hundreds of nice people that has lent us the headbands, costumes and helped us in many other ways. The final art piece is varnished to connect and protect the photography and the paint on canvas. 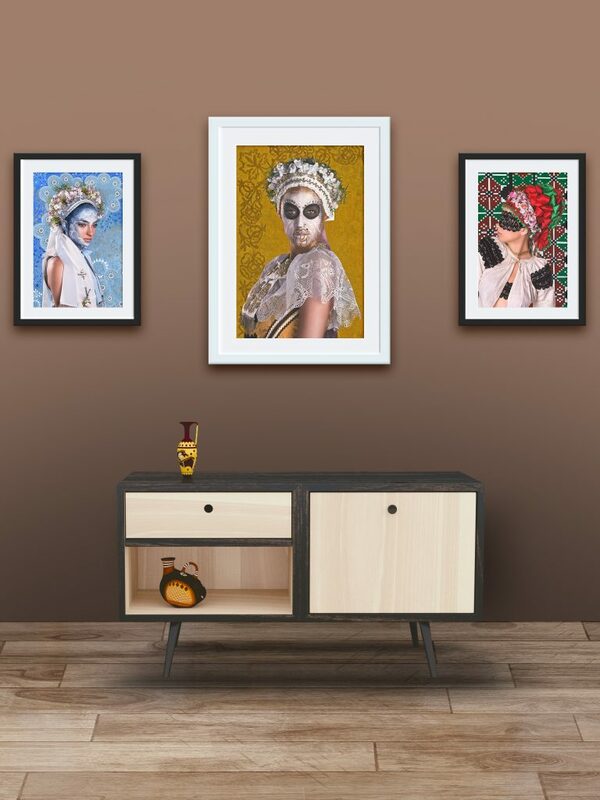 The photography itself is printed in highest quality and special color print technology, with guaranty of color stability for at least 100 years. The painting itself is done mostly with really small brushes and repainted in approximately 8 hand painted layers of color to achieve the intense color expression. The edges of each canvas are also hand painted, so there is no need to frame them. As you can imagine, to create even one of these art pieces takes a hard but passionate work of many people and a very good organisation. Generally, it takes approximately one month to finalise just one art piece. That is also why every piece is limited to three originals - everyone in a different size. The photography on every one of these three is identical, however, each of them is hand painted by myself. Each of them comes with a Certificate of Originality. 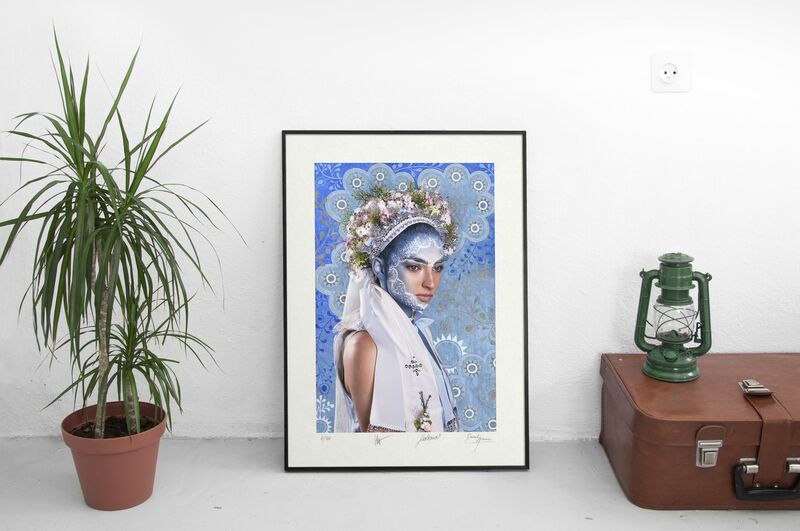 All of them are available in finest quality also as a Limited Edition of Fine Art Prints, each numbered and signed by authors.